Synopsis: A man wrongly convicted of conspiracy to commit espionage against the U.S. is offered his freedom if he can rescue the president’s daughter from an outer space prison taken over by violent inmates. Review: If ever there existed a movie that needed Ritalin then Lockout is it. At certain points during this dreary piece of Eurotrash cinema one feels inclined to stand up and just fling a jar of Adderal at the screen in hopes that it will calm down and focus itself. What looked to be a fun and pulpy sci-fi actioner is really just the grandly dumb product of hyperactive directors, a jagged edged editor, and a hollow script. 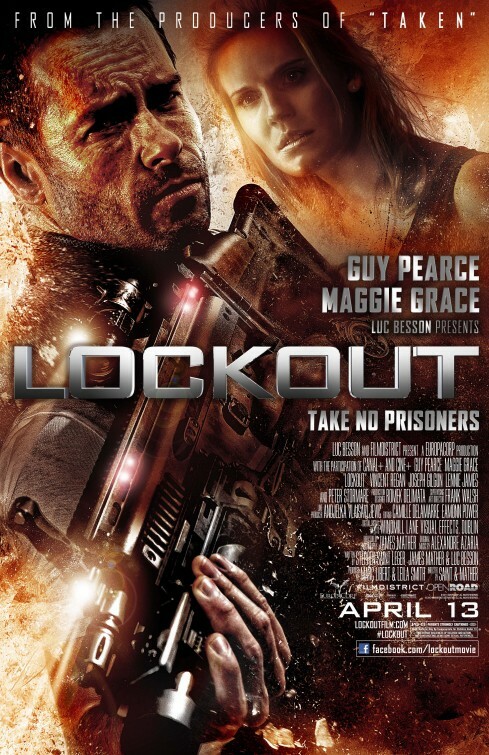 Released internationally as MS One: Maximum Security, the film has been renamed Lockout for US audiences in head-scratching fashion. Who exactly is being lockedout is the least of your worries…because after 20 minutes it’s clear you are the one locked in to another 70 minutes of bad acting and depressingly bad special effects. Filmed in Belgrade, Serbia on sets that looked to be left over from the original Star Trek series, the first thirty seconds shows promise. Then people start talking and, y’know, moving around and that’s all she wrote. One thing you can’t say about this movie is that it lacks forward momentum. In fact, it’s in a perpetual state of motion moving so fast that it actually gets ahead of itself at several points. Woe be the audience member that looks down at their Sour Patch Kids to search for an orange one because you may just miss an entire storyline crammed into several seconds of film. Nothing in the movie lasts long…ideas, plans, disguises, alliances, trust…it’s all fleeting and based solely on the whim of directors Mather and St. Leger. Frenchman Luc Besson had some good success in the 80’s and 90’s with several key films that I do enjoy: The Big Blue is an underappreciated epic (seek out the moody Director’s Cut), The Professional is a delight, La Femme Nikita’s style endures, and The Fifth Element is so off the wall weird that I consider it a classic. Lately, he’s been producing low-budget action fare that makes a killing in international markets and sometimes scores big in the US. He contributed to this script from his original idea and on paper you can see where the appeal of the film is. It’s not hard to imagine this going the big studio route and snagging some big talent to board ship. Unfortunately, Besson has good ideas that don’t translate well in the script department. Dialogue seems to have been translated from French using the Alta Vista Babel Fish translator I relied on so much to get through Spanish in college. How some of these actors could say these lines with a straight face is beyond me…but I have a feeling many of these supporting characters didn’t speak much English to begin with and were just happy to be on screen. Speaking of these supporting characters, I’m wondering if there wasn’t some Win a Line in a Movie lottery held while casting. You’ve never heard line readings quite as bizarre as you will should you choose of your own free will to see it. Try hard not to stifle a laugh anytime the actor playing the President has a line. Double that suppressed laughter when Stormare garbles out his dialogue in his still broken English (dude…even Penelope Cruz has mastered our language…get with the program). At the center of all things is Pearce looking alternately bored and asleep. Pearce is better than this material and he knows it…so why would he have agreed to star in this stinker? Was he desperate to see the foothills of Belgrade or taste the fabulous blood sausage of Serbia? It’s a mystery…though not as big of a mystery as to why the producers went with Grace as his leading lady. Grace has a bad case of the January Joneses in that she can’t act her way out of a Ziploc bag…but maybe it’s not all her fault as she is asked to deliver some heinous dialogue in an equally heinous wig. You want logic? Look somewhere else. I could have filled this entire review with plot holes and problems with consistency. For example…at the beginning the film takes place in space and on earth. The year is 2079 so let’s give the filmmakers a break and say that space travel has greatly improved in that amount of time. How, though, could Pearce be having a conversation on earth while Grace is up in space when suddenly she is taken hostage and he is in space prepped to help her within 10 minutes. There’s more to it than that but trust me when I say that how people get where they need to be defies the space-time continuum and it happens multiple times throughout the film. I love a good space epic and/or futuristic movie because that’s when filmmakers can let their creativity run wild. In Lockout there is unfortunately nothing that indicates our future has any innovation to it at all. Where are the big ideas or shoot-for-the-moon inventions? Aside from the central idea of a prison in space there is zilch in terms of progress. The special effects are straight out of a Sega Genesis game…the one that your grandma gave you and you never played. Low-budget or not there is simply no excuse for effects this bad (look at the excellent Moon for how far a micro-budget can be stretched). I swear there were a few shots were they simply forgot to digitally add the actors faces in…so it looks like space suits have no one in them. It’s just another nail in Lockout’s flimsy space suit that eventually depressurizes the entire affair. Bad dialogue, atrocious acting, goofy effects, and a terrible musical score make Lockout a real labor to get through. Ninety minutes will no doubt feel like a space age eternity…it’s the kind of movie that you’d see in Redbox and debate whether to use your free code on. Please do trust me when I tell you to see anything else available instead of selecting this as an option. Synopsis: While trying to save their childhood orphanage, Moe, Larry, and Curly inadvertently stumble into a murder plot and wind up starring in a reality TV show. Review: The first thing I have to say to you reading this review: Don’t Judge. I took one for the team (you). With each viewing of the trailer for this big-screen version of the classic Three Stooges shorts, I would turn to my movie companion and say “I will NOT see that one…even if it’s free.” Well…I lied. I had the chance to see this for free before a screening of another movie and decided to just go for it. In some ways, I’m glad I saw this so I can say I’ve seen the worst film of 2012 when that list is released in December. In other ways…I’m wondering if the 92 minutes I spent with this waste of film will be worth it when I’m taking my dying breath. With a mess this massive where do you start? Do you mention the history of the piece first? In development for years, at various times Larry, Moe, and Curly were to be played by Sean Penn, Johnny Depp, Paul Giamatti, Jim Carey, Benicio del Toro, Johnny Knoxville, Andy Samberg, Ben Stiller, and Tom Cruise. While none of these actors is really known for saying no to bad scripts…they deserve a round of applause for sitting out. The stooges may grow up but they don’t get any wiser…I blame the nuns. In Episode 2 we learn that the orphanage is set to be closed unless $830,000 is raised. Of course that means that Larry, Moe, and Curly venture out into the world to try to raise it in 30 days or less. Let me tell you..a lot of stuff happens in 30 days in this here film. They get involved in a murder for hire plot, they open a free range salmon farm (not kidding) and Moe gets cast on “Jersey Shore” (really not kidding). It’s at this point the movie becomes The Eight Stooges as the entire “Jersey Shore” cast is thrown in the mix…and I can’t help but wonder what audiences five years from now will make of it all. Jokes about the “Jersey Shore” are so dated already that it won’t be long when people will forget it was a show at all. 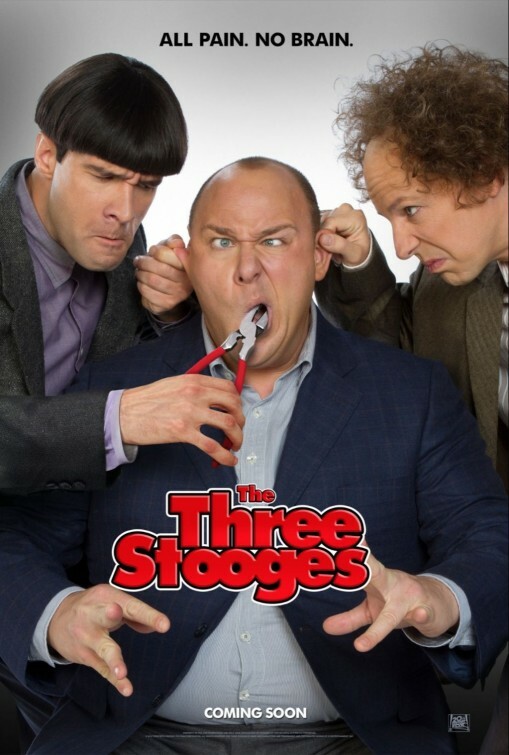 The Three Stooges started out as a vaudeville act known for their physical comedy and creative slapstick and if the movie has anything at all to redeem itself it’s in several moments of well staged schtick. Ninety minutes of that wears thin when you consider the original shorts were about 20 minutes long. Sasso has Curly’s comedy nailed but it never goes further than a really good impression. Faring much worse is Diamantopoulos and his labored attempt to recreate Moe’s grimace and cadence…you absolutely never forget he’s acting…and it’s exhausting to watch. Worst of all is Hayes in an embarrassing career low that couldn’t even be saved by a letter in defense of him from Kristen Chenoweth to the editor of Newsweek. Craig Bierko and Sofia Vergara are in full Scooby Doo villain mode as a pair of crooks looking to the stooges to help them murder Vergara’s husband. Here’s where I had the biggest issue – The Three Stooges is rated PG for “slapstick action violence, some rude and suggestive humor including language”. This movie is SO PG-13 and absolutely not something parents should bring their kids to. The MPAA is seriously cracked if they think this movie pulled a PG – I was pretty shocked at the violence (comedic or not) on display in this film being watched by an audience full of children. People are stabbed, blown up, hit in the face repeatedly by sledgehammers and other items sure to chip a tooth. One hapless extra is even burned by two hot irons. Hey, as long as it makes people laugh it’s OK, right? Before the credits roll there is a small PSA-like ad telling kids not to try these gags at home…but since most people will be running for the door this message should have come at the beginning of the film. There’s the other problem…for a comedy this was a laugh wasteland. The audience I saw this with were either asleep or knew better than to waste precious breath on a guffaw. In fact, it was eerily silent at some moments clearly intended to send the audience rolling. It would be easy to blame one director for running this ship aground. With The Three Stooges..we have two. The Farrelly Brothers have, let’s face it, never made a good movie…well…Fever Pitch wasn’t too bad and There’s Something About Mary was so-so. It’s easy and justified to blame them for writing and directing this mess…but it’s time to really run them out of Hollywood for good and all. This is such a punishingly bad film that you won’t just lose braincells by seeing the movie…I think you’ll get dumber walking BY a theater playing this. My advice would be to steer clear of any theater this is playing at until it’s out of the cinemas…which hopefully will be fast and furious.